This season of Celebrity Apprentice was full of drama and surprises. The surprises came in the form of who Trump decided to fire each week. There were many times when the obvious weaker player was kept and a stronger player was sent home. The way I see it, there are 2 reasons to keep someone on the show, 1 they are a good player who is involved and wants to earn a lot of money, and 2 they cause a lot of drama and are good for ratings. Trump did not really follow either of these so it made his decisions baffling. In my opinion it should have been Aubrey and Lisa in the finale. Both of them were the stand out players who were passionate about winning and were also entertaining. Instead, Clay and Arsenio were chosen. They are ok, but certainly not the top 2. 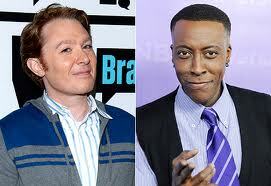 Then in the finale, Arsenio was picked as the winner even though he raised much less money. Trump did not really explain his decision. Maybe he was just trying to surprise people. Well he did, but picking the wrong person to win is not a good surprise. Overall, the show is still fun to watch, but Trump need to make better decisions when it comes to who should stay and who should go. The new season of America's Got Talent has started, and while I have enjoyed previous seasons, so far, this one has not been very good. Maybe it is because it is still early on, but the acts have been pretty weak in my opinion. I don't like how they try to enhance it with pop songs overlapping the content. They need to focus on unique acts and less over production. I may get back into this once they narrow down the field. American Ninja Warrior has been around for a while, but it is just now being aired on a major network. I like physical skill competitions, so I was looking forward to this one. Overall the show is ok, but it gets old quick. With contestants doing the same course repeatedly, it gets boring especially in qualifying rounds. This would work best as a 1 hour special with the top 10 competitors, like what they did last year. One thing I don't like about the courses is how there is so much emphasis on upper body strength. Being a ninja is not all about pull ups and hanging from things. There should be more agility and balance obstacles. I might watch this, but only if there is nothing better on. UPDATE: 6-5-12 American Ninja Warrior chances the courses each week so it is not as repetitive as I thought.